Modern-day internet marketing is full of cutting-edge alternatives to connect with the prospects. Be it Email newsletter, RSS feed, or SMS marketing, the primary aim of each of the channels is to connect the businesses with their potential customers. 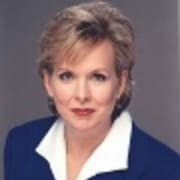 Another method of promotion that is equally gaining a pronounced name among the marketers is Push Notifications. Indeed, push notifications have come as an asset to the brands. No smart marketer would deny the ability to connect with the target audience without even knowing their contact addresses (Email or Contacts numbers). A single click on the “Allow” button, and boom, you can start sending real-time messages to your prospects. 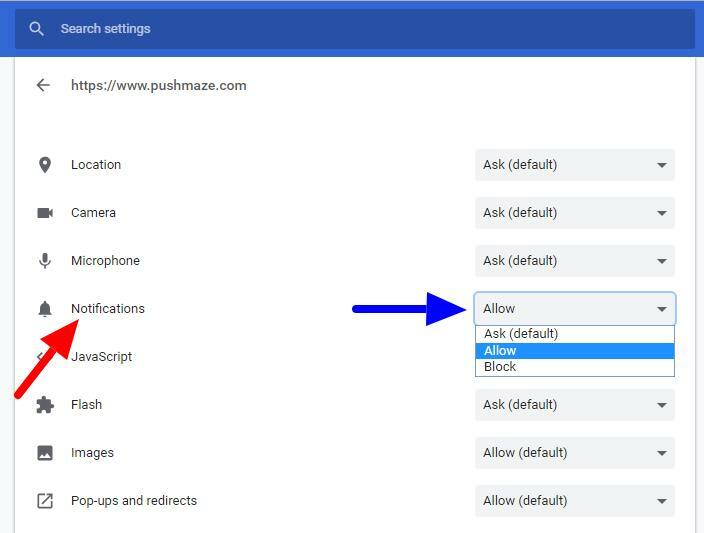 Push Notification, Push Alert, or so-called Push Messages Service is a short clickable communication triggered to a subscribed user on a supported device by a website or mobile app publisher. In order to send an alert to a user, the mobile app or website must ask for permission from the user (As shown in the image above). Web Push Notifications- Triggered by websites to their subscribed visitors on browsers. App Push Notifications- Triggered by mobile app publishers to their users on their smartphones. Desktop Push Notifications- Triggered by websites to their subscribed users on desktop browsers. 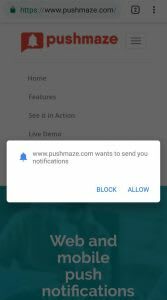 Mobile Browser Push Notifications- Triggered by websites to their subscribed users on mobile browsers. For triggering web push message on any supported device, the website shows a pop-up asking for permission from the users. Once clicked on the “ Allow ” button, the website can send push alerts to such users. It is equally true for App alerts, except for Android-users are subscribed to them by default while installing a particular mobile app. Moreover, iOS users need to enable push notifications manually after installing a mobile app. 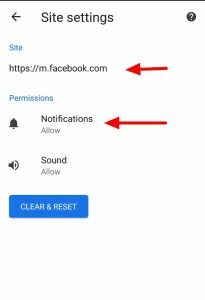 In this article, we are going to focus our discussion on a special category of web alerts – the Google Chrome push notifications. We will understand how chrome push notifications work and how to turn on Google Chrome desktop alerts and mobile. 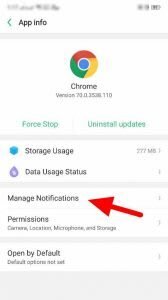 How do Google Chrome Push Notifications work? 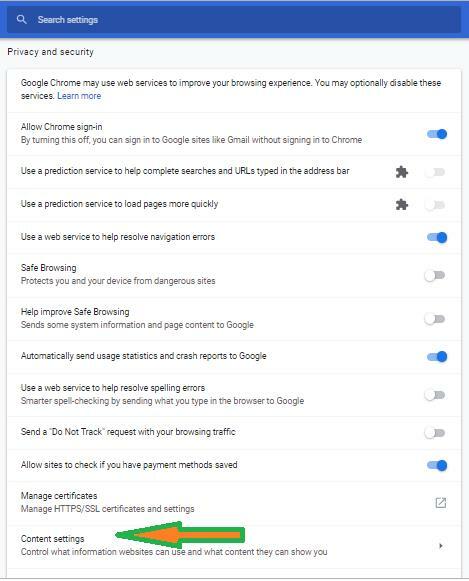 #2: Once allowed, Google chrome stores the preference in the user profile setting after sending the same information to the server. 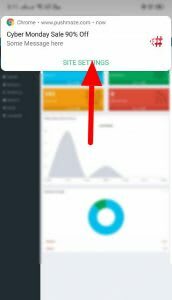 #3: Based on the triggers and conditions set by the website with the server, the API selects and sends a particular alert to the subscribed users. Users see it in various styles depending on the Operating System and device they are using. 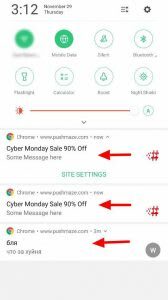 For mobile Google Chrome browsers, users need to allow the messages in two stages- one: Allow notifications for Google Chrome Mobile browser App. Two: Allow alerts from a particular website. You can learn more about technical implementation and Google Push API from developers.google.com. 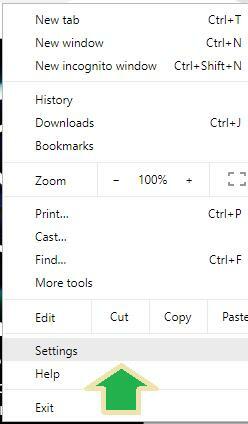 The default settings for both desktop and mobile versions of Google Chrome browser are set in sensible ways. 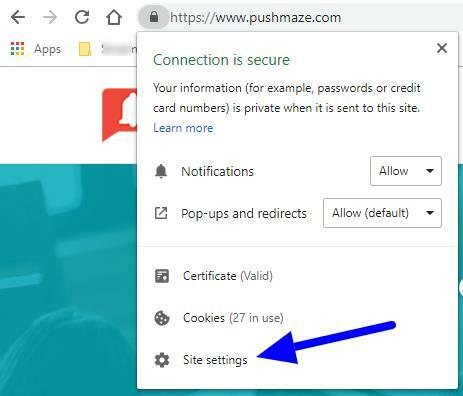 When a user lands on a website with push enabled on it, the browser always prompts a new user to “ Allow ” or “ Block ” the same from the particular website. It prepares two separate lists of the “ Allowed ” and “ Blocked ” websites, and serves the alerts as per the preferences. Scroll down to find “ Content Settings ” under “ Privacy and Security ” tab. Click on Content Settings. Under Content Settings, scroll down to find “ Notifications ”, and click on it. 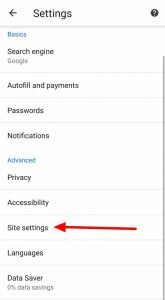 Ask before sending – Toggling off this setting will block all notifications on Google Chrome browser. You will not receive any message from any website, even if you have subscribed to it. Block -This is a list of all the sites to whom you have blocked. These sites cannot send alerts to your browser. Allow – This is a list of all the sites allowed to send message on the browser. You can even manually add or remove a site from the two lists. 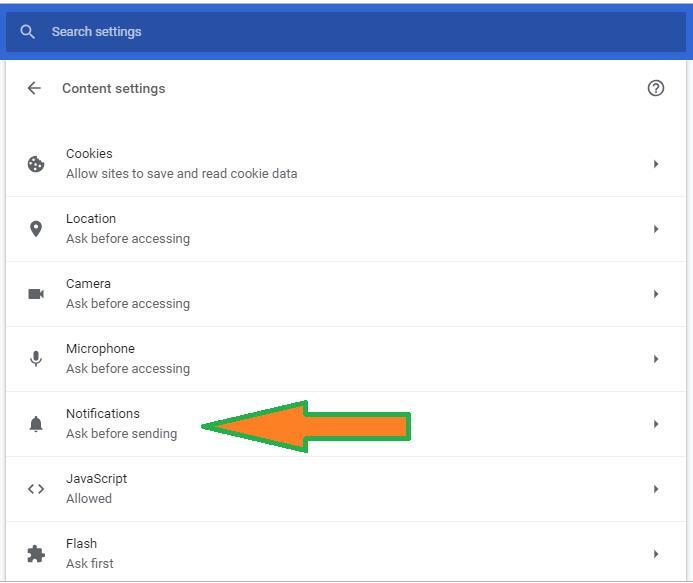 Users can also control the Google chrome notifications settings for each site individually. Click on the lock icon that says, “ View site information ” in the address bar. Scroll down to find “ Notifications ”. Select “ Allow ” or “ Block ” option from the drop-down menu. Apple does not support Google Chrome push notifications. Hence, it is not possible to send web alerts on the Google Chrome browser for iOS devices or Mac. However, the native web browsers on Apple device do support web push notifications on Safari browsers on Apple mobile or Mac. Google Chrome is present on Android devices as a mobile app. Hence, by default, the app is allowed to trigger alerts to users. 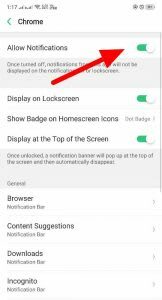 However, if a user wants to disable all the notifications from the app, they can do that by going to the App setting interface of the Android phone. 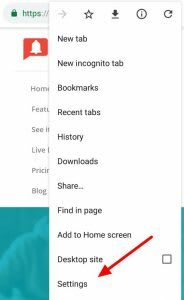 Find the Google Chrome App in the Mobile Settings>> list of App installed on the phone. Under App setting find “ Manage Notifications ” and change the setting in the next interface. Websites on Android Chrome browser ask of the permissions in the same way desktop does. 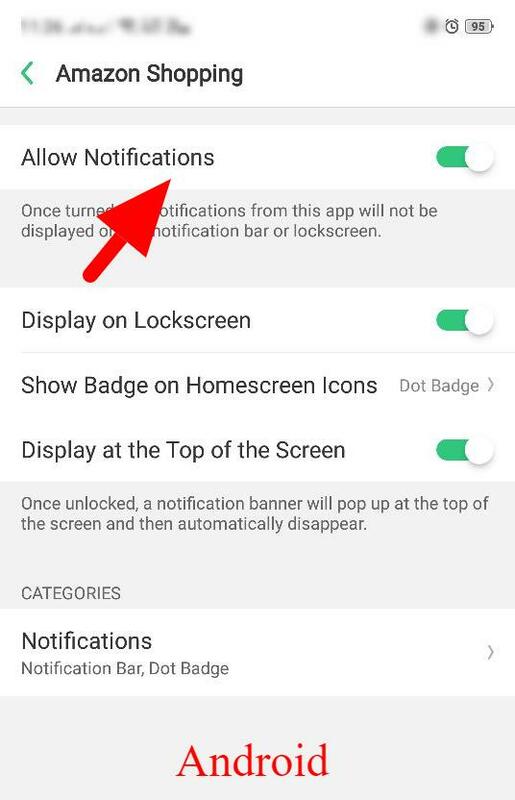 Users can “ Allow ” or “ Block ” notifications based on their preferences. Scroll down to find “ Notifications ”, and tap on it. Under Notifications, you can see a similar option we saw in the desktop version. 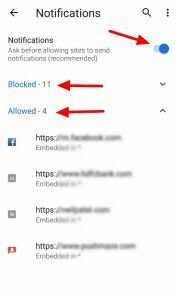 You will find toggle button to disable all and two separate lists of “ Allowed ” and “ Blocked ” sites. You can tap on each site to change the preferences, as you require. How do Chrome Push notifications look like? Google chrome notifications are shown to the users on different platforms in dissimilar ways. For desktop users, the messages are shown in the lower right corner as a banner. Please note that users need not actively browsing a site to receive the push messages. The subscribed users can see the same even if they are not browsing the particular site actively. For mobile users, alerts are shown in two different ways. Users see notifications as a banner on Windows and Android devices. On Safari browser, push alerts are shown in the native alert style of Mac. No alerts are received when browsing in incognito mode. Chrome browser does not receive push in iOS or Mac devices. Publishers cannot send notifications to the unsubscribed users. Users cannot receive alerts on sites that do not have push notifications services enabled through the server. 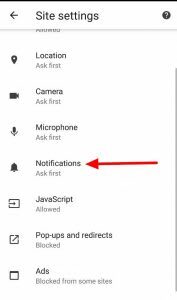 The post How to turn on push notifications for Chrome browser? 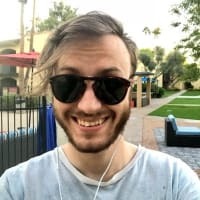 appeared first on Pushmaze.